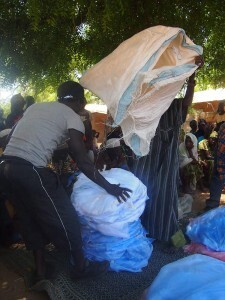 Mosquito nets: we aim to provide at least one net per family in the rural village of Generie. Malaria is the biggest killer in The Gambia, and as Generie is many hour’s drive to the closest hospital, nets will reduce the fatality rate. Therefore our target is 400 nets; up to now we have provided 150 nets! A donation of £5 will buy one net bought from within the Gambia. Some donations from this may have to be used to treat people with malaria. When we sponsor children from Generie, they each receive a mosquito net from the £40 sponsor money for the year.